The Extra Large Ergo Grinder 4 Piece is an industrial strength grinder for herbs and spices that is constructed from an extremely durable aircraft grade aluminum. 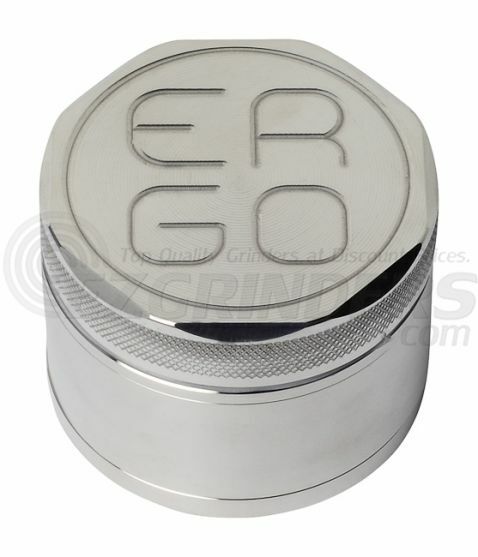 As the name suggests, Ergo's extra large grinder comes equipped with an ergonomically designed lid. This lid design coupled with it's micro-ribbed finish provides users with an exceptional grip that allows you to quickly shred through a chamber full of material with the utmost ease. A strategic tooth layout with extremely sharp diamond shaped teeth shreds through all types of material without batting an eye, whether your herbs are extremely dense, moist or dry the Ergo grinder can handle it. A removable stainless steel sifting screen separates any pollen that falls from your herbs and transfers it into the final collection tray for easy removal. This sifting screen can be swapped with one of Ergo's three different styles of screens (sold separately), allowing you to customize your pollen collection to fit your liking. 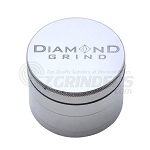 Within every 4 part Ergo grinder you will find two neodymium magnets that offer a dependable closure, leaving you with a secure grinder that will not pour all of your material onto the floor after a severe fall. Ergo's Extra Large 4 Part Grinder features a diameter of around 3.5" or 90mm, making a great choice for those looking for a grinder that can grind and store substantial amounts of material at any given time.